New Zealand’s native forests were once logged for wood. By the start of the 20th century, the government realised that to have enough wood in the future, they would need to plant new forests. They planted exotic trees – species from overseas, which are faster and easier to grow than native trees. They included eucalyptus, larch, Douglas fir and different kinds of pine trees, including radiata pine. The government Forest Service planted new forests, and so did more than 20 companies. 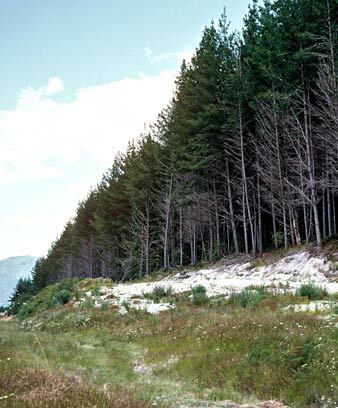 The Kāingaroa plains, in the middle of the North Island, were perfect for planting a new forest. They were fairly flat, had only grass and scrub, and were not very good for farming. Lots of people were employed in planting the forest, including unemployed men on work schemes during the 1930s depression. It was hard work in rough and cold conditions. By the 1950s the trees had grown big enough to harvest. Some of the wood was cut up into timber, and some was made into paper and wood pulp. Sawmills, and pulp and paper mills, were built to process the wood. New towns sprang up near the mills and the forests, so the workers and their families had somewhere to live. They included Tokoroa, in southern Waikato, and Kawerau, in the Bay of Plenty. Until 1990, most of the forests were owned by the government, but it decided to sell them and many of the forests were bought by companies from overseas. Some people disagreed with New Zealand forests having overseas owners. Some of the land that was used for growing trees is now being converted into farms or lifestyle blocks. But many people still work in forestry and others are researching new ways to use wood, including combining it with synthetic materials.